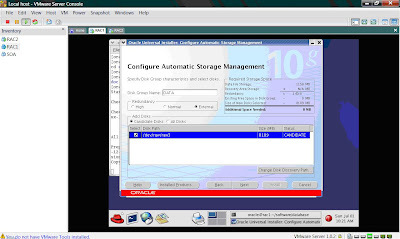 This is fourth and last post for installing Oracle RAC Database on single machine using VMWare virtual machines. 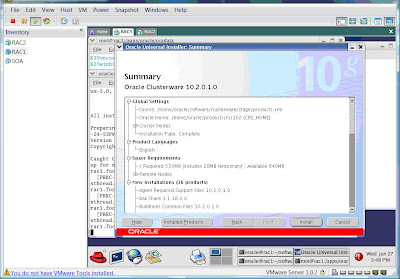 Once RAC1 and RAC2 can ping each other and oracle user can connect to other machine’s oracle user without prompting password then start clusterware installation from user oracle. Change subnet as per your network configuration as you did while configuring network card. Click on Install to install clusterware. Why number of voting disks should always be odd number only ? How to troubleshoot RAC database and clusterware issue ? Add second node rac2 by clicking on Add link,after adding second step i am geting below error. The name rac1 you entered is being used more than once for the same node. can u pls let me know how can solve this problem. On which step of this doc you are facing this issue ? 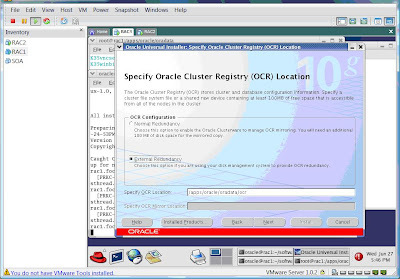 Oracle RAC Part IV : Install Oracle Clusterware and Cluster Database. i am facing my problem here. while adding second node i am getting this error. while specifying OCR location i am geeting below error. 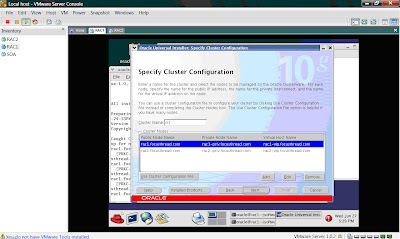 partion oracle cluster file system that visible by the same on all nodes on the cluster. can i pls get help on this. You again missed some of step from previous part. Make sure you can view ocr filesystem/directory from both nodes. check again that you followed all steps documented. How do I download the files mentioned and copy them over to my vm???? Atlast my dream comes true by installing RAC, becos of UR great articles in this post. Delete a node from their 3 node RAC and go down to 2 nodes. Yes, the application can run fine with 2 nodes! Build this deleted node as a 1 node RAC with RHEL4.0 and 10.2 from scratch. Set up this new node as a physical standby for the 2 node RAC primary. 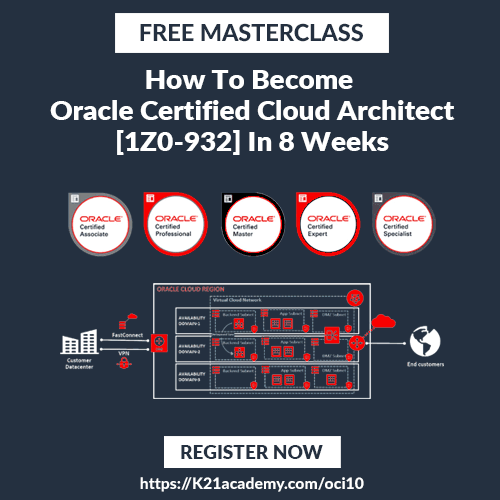 Then delete the 2nd node from the primary and build it from scratch with RHEL4.2 and Oracle 10.2 and add to the single node standby to make it into 2 node standby. Then do a FAILOVER from the 1 node primary to 2 node standby. Make this 2 node standby as the new primary. Rebuild the old 1 node primary with RHEL4.0 and Oracle 10.2 and add it to this new 2 node primary to make it a 3 node primary. This will take a lot of time, but this will provide us with little downtime. So as you can see the Data Guard is not used for DR purpose. It is used for upgrade purpose. If this is possible, then we don’t want to ask the customer to invest in additional servers for the upgrade. Can this be done or am I dreaming? In our company our Linux admin team have planned to do a fresh install of RH 4 becos of some internal issues present in OS(Due to implement of wrong methods in applying OS patches) hence we(DBA) are facing lot of DB performance issues…..
Can you plz suggest that the above solution mentioned in my last post is possible or not!!!!!! If possible is there any other way to achieve this target with less downtime…. Thanks for such an excellent step by step instruction about RAC. Try this with all RPM’s in place and any other required prereqs. Did anybody get Oracle 10g RAC installed successfully using this detailed guide? I am having raw file permission issues and I found a fix on 2-day RAC on oracle website. Same instructions to different people can lead to different results. my root.sh stopped somewhere when installing clusterware. and i found out that /dev/raw/raw? permission has been changed from oracle:oinstall to root:oinstall. So I went to oracle office website for instruction and they said a file /etc/udev/permissions.d/oracle.permission needs to be created. But for some reason, it still doesn’t work so put the scripts to /etc/rc.d/rc.local and I re-install clusterware it is successful (of course I removed some files left by previous installation). When running root.sh during clusterware installation on rac2, I need to manually run vipca in X to setup the vip interface. Then I got the online staus when running ‘crs_stat -t’. Yeah!!! Thanks Atul, you really did a good jobs guiding a novice like me to advanced RAC. Hi Anonymous , first of all congrats for successful RAC installation on your PC/Machine/Laptop. Thanks for sharing this information and yes are true, Same instructions to different people can lead to different results (If even small things is skipped, changed, missed or errored out). To clarify, I was using Enterprise Linux 4 Update 4 downloaded from Oracle Official website. But your guide is using Redhat Linux ES3. Probably that is the reason. Thanks. you must enter unique values for the public node name ,private node name and the virtual hostnames for all the nodes in the cluster. The name , rac1 you entered is used by more than once for the same node. how come I can only create a single ASM instance vs clustered ASM instance when creating the database? Every server running one or more database instances that use ASM for storage has an ASM instance. In a Real Application Clusters environment, there is one ASM instance for each node, and the ASM instances communicate with each other on a peer-to-peer basis. Only one ASM instance is required for each node regardless of the number of database instances on the node. there is no need to create multiple ASM instance on single machine hosting multiple database. 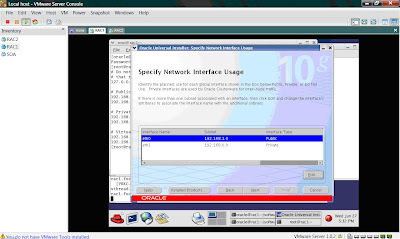 I’ve change the display name and i’ve check the user equivalence also, everything it is showing passed accept the virtual-ip node connectivity. I thought the VIP interface should not work until *after* the cluster installed and VIPCA ran. I’ve check all ssh combination also it is working fine . I also had same issue which I resolved by putting three IP’s . Do let me know if you hit same issue after this change. Hi Majid I’m getting the same error as you are did you manage to fix the error? I am also facing the same issue while adding the node two in the clusterware. The name rac1 you entered is being used more thatn once for the same node. Completed all the Rac2 clone steps very carefully , changed the display name to Rac2 as specified in the post. Still I’m facing the same problem after changing the /etc/hosts file. Can we configure the RAC with same network card both vip and public access same. For configuring RAC is it compulsory to have 3 network cards – 1- public, 1-vip , 1-priv. I have followed line by line and word by word of your doc, i still face the same issue of ” unique values for public node name, priv node name, virtual host name for all nodes in the cluster”. Please do let me know how to resolve this issue. Hi Guys I’ll reconfigure and test it that why u r facing this issue. Give me three weeks and I’ll rebuild this RAC machine and update any thing missing. Please let me know if this error is going to be solved. Thanks for that. I did check that, and had edited that as per your instructions. I am still getting the error despite that. i successfully configured RAC with ASM based on your step by step approach. 2)regarding ssh without passwords i changed home direcory permissions 700 (by default )with useradd and chmod .Instead of oracle group, i created oinstall(primary) and dba groups only with useradd. If you follow these changes,atul’s approach may lands you towards success. After running the command “./runcluvfy.sh stage -pre dbinst -n rac1,rac2 -r 10gR2 -verbose” i got the following output. Result: Node reachability check passed from node “rac1”. 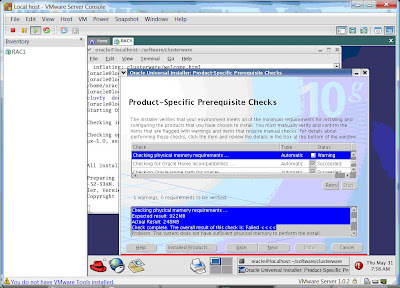 Result: User equivalence check passed for user “oracle”. Result: User existence check passed for “oracle”. Result: Node connectivity check passed for subnet “10.0.0.0” with node(s) rac2,r ac1. Result: Total memory check failed. Result: Package existence check passed for “make-3.79”. Result: Package existence check passed for “binutils-2.14”. Result: Package existence check passed for “gcc-3.2”. Result: Package existence check passed for “compat-db-4.0.14-5”. Result: Package existence check failed for “compat-gcc-7.3-2.96.128”. Result: Package existence check failed for “compat-gcc-c++-7.3-2.96.128”. Result: Package existence check failed for “compat-libstdc++-7.3-2.96.128”. Result: Package existence check failed for “compat-libstdc++-devel-7.3-2.96.128” . Result: Package existence check passed for “glibc-2.3.2-95.27”. Result: Package existence check failed for “openmotif-2.2.3”. Result: Package existence check passed for “setarch-1.3-1”. Result: Kernel parameter check passed for “semmsl”. Result: Kernel parameter check passed for “semmns”. Result: Kernel parameter check failed for “semopm”. Result: Kernel parameter check passed for “semmni”. Result: Kernel parameter check passed for “shmall”. Result: Kernel parameter check passed for “shmmni”. Result: Kernel parameter check failed for “file-max”. Result: Kernel parameter check failed for “rmem_default”. Result: Kernel parameter check failed for “rmem_max”. Result: Kernel parameter check failed for “wmem_default”. Result: Kernel parameter check failed for “wmem_max”. Result: Group existence check passed for “dba”. Result: User existence check passed for “nobody”. CRS is not installed on any of the nodes. I made changes in the hosts file as u said. But still i am getting the same error. In the second node the hostname is rac2 only, when i am giving hostname -a its showing “rac2-vip rac2-vip”. can u pls advice me to solve this error. RAC requires three different ip-addresse for each node. Below the #Public and #Virtual is using the same ip-address. Change the #Public or #Virtual addess, see example in the bottom. I am getting the same error inpsite of making changes..
Will I be correct to say the following error which everyone is getting i.e “The name rac1 you entered is being used more than once for the same node” will not arise if I create a virtual machine for RAC2 from stratch instead of clonning it for RAC1. I am about to get to that stage and I just want to know if this can be a workaround for the above error. can you help me out Configuring the RAC in the LAPTOP.i tried to install the Clusterware in the laptop every thing is ok but for storage how i need to share the NTFS file system to both RAC nodes. Please give me the step by step to share the NTFS FILE SYSTEM I FOLLOWD THE DOC.but i’am unable to install .Please guide me. I have executed root.sh and orainstRoot.sh all are perfect except oracle cluster verification utility failed because of vip. I installed it successfully with your notes here. Thanks a lot. Keep up the good work. When are you planning to write on troubleshooting on RAC & Clusterware. The vitural hostname(s), rac1-vip, rac2-vip, you have specified appears to be already assigned to another system on the network. Please ensure that the virtual hostnames that you use for each of the nodes in the cluster are not in use currently. I solved the problem after inactive eth2. Thanks. I would like to grab this opportunity in congratulating you on successfull running of a knowledge fulfilled site on APPS. If I keep the following entries in the /etc/hosts file i am getting the error “The virtual hostname(s), rac1-vip,rac2-vip, you have specified appears to be already assigned to another system on the network. In both the above cases I configured 3 ethernet cards and I gave each value to each ethnercard. Could you please help me in resolving the issue. root.sh is hanging when installing 10g clusterware(10.2.0.1) in my laptop. how to solve this problem ? orainstRoot.sh scripts ran successfully on both nodes.but when running root.sh it is hanging indefinitely. Result: Daemon status check passed for “CSS daemon”. OCR of correct Version “2” exists. OCR integrity results are inconsistent amongst the nodes. Result: Liveness check passed for “CRS daemon”. Result: Liveness check passed for “CSS daemon”. Result: Liveness check passed for “EVM daemon”. Result: CRS health check passed. Post-check for cluster services setup was unsuccessful on all the nodes. getting this error while installing creating the asm instance..
looks like shared drive not working proerly..
please help to solve this issue..
OCR ID is inconsistent amongst the nodes. Possibly different devices are in use across the nodes. – – Consult with your sys.admin. and ensure that access to the same device across the nodes. – Refer Note 414897.1 and have the settings done for these raw devices. Thanks for useful information . assigning default hostname mac1 for node 1.
assigning default hostname mac2 for node 2. I have downloaded the software on C:\ drive. How do i move software into vmware or how to configure internet on the vmware server to download the software into vmware itself. Please help. Result: Node connectivity check passed for subnet “192.168.2.0” with node(s) rac2,rac1. Result: Node connectivity check passed for subnet “10.0.0.0” with node(s) rac2,rac1. hi, when i run the root.sh on both the nodes rac1,rac2, it failed with error “ocr is inaccessible”. Please help. I followed the steps as it is. Atul, how the disks will be shared across, Also i would like to check if it was a shared location by changing permissions on node1 and check if it was reflected in node2. First let me say how great this tutorial is that you created. I’m working thru a few issues with the install on my laptop. I’m using OEL 5.4 for this. Below is the errors that I’m currently trying to resolve. Any thoughts on what is going on? Node connectivity check passed for subnet “192.168.1.0” with node(s) rac2,rac1. Node connectivity check passed for subnet “192.168.0.0” with node(s) rac2,rac1. I’m getting this on runcluvfy. Anyone knows what the memory requirements are? See below error. I have 512M for swap now by default. my self prasad babu.I have very usefull of the scrits . I found your blogs very useful, infact this is the first time i check and impressed. Would like to contact you via email to discuss something about oracle dba task. Tried with Raw devices . 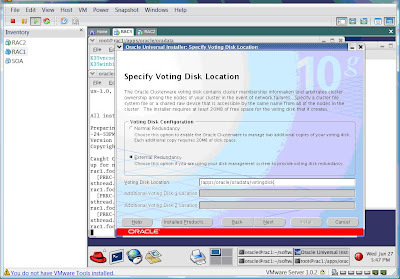 and Voting Disk has oracle:oinstall Permissions. But Still Fails. Could you Please give me any Suggestion.